With the largest barrier reef in the western hemisphere and three of the four major atolls in the Caribbean, including the famous Blue Hole, Belize is ranked as one of the top three dive destinations in the entire Caribbean. The waters are teeming with marine life in all sizes and shapes, including 70 types of hard corals and nearly 500 species of fish. Mexico Rocks, a unique patch reef inside the barrier reef, ideal for novice divers and those who like to do underwater photography. Boca del Rio, is named after the statue of Christ that can be found there at around 60 feet, Tackle Box Canyons for swim-throughs and tunnels (keep a look out for sleeping nurse sharks, moray eels and lobsters who like to make this terrain their home). Esmarelda has spur and groove formations that are shallower than most and the fish life is prolific, with blue tangs, squirrel fish and schoolmasters among many. Hol Chan Cut is the most popular site in the Northern Cayes for snorkelers and novice divers and the sheer variety of fish that congregate here is mind blowing. Expect to see bluestripped grunts, schoolmasters, jacks, southern stingrays, eagle rays, green moray eels, nurse sharks and even tarpon. Large groupers and turtles often hang out in this protected area and seem to like having their picture taken. Faegon’s Bluff, where two reefs are separated by sandy flats attracting large shoals of sardines and needlefish, often trailed by prowling barracuda. At Fishy Point, the reef drops sharply from 60ft to a 100ft sandy plain where blue tangs gather by the hundreds to feed along the slope. Grunts, black groupers, snappers and moray eels all hide out in the overhangs. Tobacco Cut is one of the very few shore dives possible in Belize, the site is located on the south side of Tobacco Caye and is a perfect place to do a night dive. Common encounters on a night dive here include octopus, free swimming moray eels, squid and many others. At Eagle Ray Bowl southern stingrays and eagle rays feed and rest. There are a number of large gullies at the edge of the reef; on the east wall you can watch the passing reef sharks and turtles. 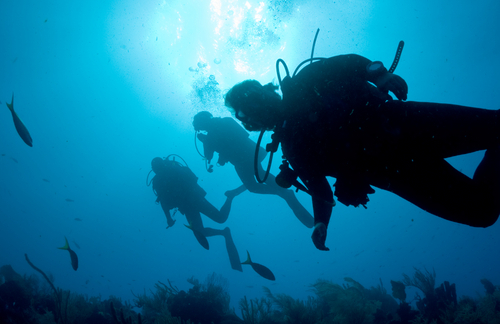 Off the sandy peninsular of Placencia boasts some of the best and quietest dive sites in Belize. The main attraction is the 13 mile long lagoon, home to almost all creatures found on the outer reef, including manatee and dolphins. At the most northern point, due to the seasonal spawning of cubera snapper between April and June, Gladden Split sees an exciting amount of fish accumulate including hammerhead, bull sharks, whale sharks, dolphins and shoaling fish. Throughout the year you can expect to turtles, moray eels, spotted eagle rays, stingrays, large grouper, dolphin, nurse sharks and the usual species of tropical reef fish. Laughing Bird Caye, part of the Belize Barrier Reef Reserve System World Heritage Site, is a submerged atoll. There is a system of patch reefs and coral ridges teeming with hard coral and sponges, plus dozens of reef species that feed on algae and each other. Keep an eye out for large barracuda feeding on the smaller reef fish. Three of only four atolls in the Caribbean are here in Belize – Lighthouse, Glovers and Turneffe. The atolls formed millions of years ago on giant tectonic faults, where limestone provided perfect conditions for coral growth. The oval shaped masses of coral have central lagoons with water 10 to 30 feet deep and the ocean falls sharply to 1,000 feet or more outside the walls, making for spectacular dive territory. There are just a handful of small diving and fishing resorts on the atolls, however they are also accessible from most tourist destinations, including as far north as Ambergris Caye. The Blue Hole is one of the most famous dive sites in the world and an incomparable natural wonder. This atoll was once a dry cave, but rising sea levels over thousands of years submerged it, causing the dome to collapse and resulting in the perfectly formed 1,000ft diameter circular hole. The hole is believed to be 430ft deep and at 130ft you can witness the world’s largest known underwater stalactites, whilst nurse sharks circle below you.